Covers, Shields and Enclosures — International Etching, Inc. Covers, shields and enclosures are essential and common components used in the electronics industry. 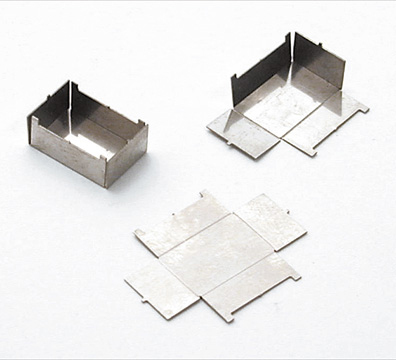 This product type is a natural for the photochemical machining process and offers several competitive advantages over more traditional metal fabrication methods. The above parts were chem-milled from .010″ nickel silver with etched-in score lines for easy bending. The nickel silver allowed brazing without a costly plating operation. The score lines enabled the product to be hand-bent right at the assembly bench without the time consuming hand tooling for forming. Score lines enabled each component to be bent evenly, stress-free, along pre-determined scores ensuring dimensional uniformity. This product is thus a highly cost-effective alternative to a hard-tooled process. Shipping time: 10 business days from receipt of order. Call for specific information on the cost of this project.